The West Coast region boasts five of New Zealand's fourteen national parks making it a nature lovers paradise. It is a land of extreme topography, from the dense rainforests to the serene lakes, from the glaciers to the rugged coastline this place is nothing short of spectacular. Many of the towns were born in the last century, during the gold rush. Greymouth, which is largest town on the West Coast, is one such place. Walks on the outskirts of town lead to many historic relics from 150 years of gold, timber,and coal extraction. A 20 minute drive south of Greymouth is Shantytown, a reconstructed 1880s gold town where you can try your hand at gold panning. The famous Monteiths Brewery is found in Greymouth (since 1868) and offers tours along with a formal tasting of each style of beer. North of Greymouth is the stunning Lake Brunner, famous as a great brown trout fishing spot. The lake makes a great place for family holidays with pinics by the lake and stunning bush walks. Punakaiki is most famous for the Pancake Rocks and Blowholes (internationally recognised as one of New Zealand's visitor icons). Karamea is a secluded haven found in the warm northern corner of the West Coast. Karamea and the surrounding area is a nature wonderland, and is the beginning (or end) of the world famous Heaphy Track and Kahurangi National Park. At the southern end of the West Coast region is Haast. Haast is a very popular fishing region and a bird watcher's paradise. The fantail, tui, bellbird, pigeon, silvereye, grey warbler, parakeet, falcon, kaka, kiwi, morepork, blue penguin and the Fiordland crested penguin are all found here. 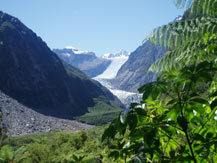 The two stunning glaciers, Franz Josef and Fox, are found north of Haast. This is a World Heritage Area, where you'll find ancient glaciers nestled amidst primeval rainforest. The West Coast could be your next holiday destination. The links below will help you guide your search through all the information on KiwiWise regarding the West Coast region.